These flower crochet patterns will work up so fast and easy that you will want to use them to decorate all your gifts this year. With red, ch 2; join to form a ring. Rnd 1: Ch 1, 9 sc in ring; join in first sc. Rnd 2: *Ch 9, sI st in 2nd and 3rd chs from hook, sc in next 2 chs, hdc in next 2 chs, dc in next 2 chs, sl st in next sc; rep from *7 times more; ch 9, sl st in 2nd and 3rd chs from hook, sc in next 2 chs, hdc in next 2 chs, dc in next 2 chs; join in joining sl st.
With dark green, ch 9; sI st in 2nd and 3rd chs from hook, sc in next 2 chs, hdc in next 2 chs, dc in next ch, 5 dc in last ch; working in unused Ips on opposite side of beg ch, dc in next 1p, hdc in next 1p, sc in next 1p, sl st in next 1p. Step 1: With sewing needle and matching thread, sew 11 beads down center of each leaf. Overlapping slightly, sew leaves into ring. 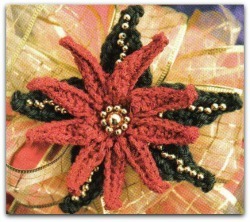 Step 2: Place flower in center of leaves and sew in place. 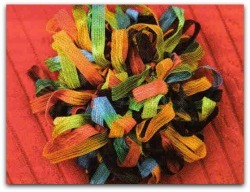 Step 3: Sew large bead to center of flower. Sew rem small beads around large bead. Row 2: Ch 1, holding piece of cardboard at back of work, carefully wrap ribbon around cardboard, sc in first sc, remove ribbon Ip from cardboard; *carefully wrap ribbon around cardboard, sc in next sc, remove ribbon Ip from cardboard; rep from * to across. Fasten off. With sewing needle and matching thread, gather first row tightly into ring and secure. Disclaimer included “This site is not endorsed by Coats & Clark.